If you have not yet had a chance to visit the updated Toku restaurant in Regent Street right next door to Japan Centre, then we have just the thing to entice you. For a whole month we are going to be offering a selection of special offers at Toku restaurant with a different offer each week. So now you can enjoy the best we have to offer at a price that we know you will definitely enjoy! So, what’s on offer this week? 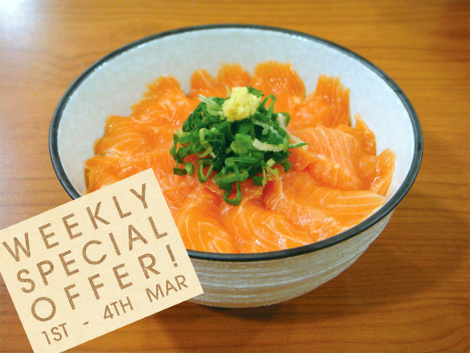 • Fresh salmon sashimi is one of our most popular dishes and for this week only, you can enjoy our authentic salmon don rice bowl for just £9, a huge saving of 30%. • For all the steak lovers out there, our tender wafu steak is beautifully seasoned with a rich garlic, onion & soy based sauce and served with rice and miso on the side. With 35% off the normal cost, it is guaranteed to satisfy. • Maybe you aren’t hungry today and just fancy a drink. Simply print out the voucher and hand it in at Toku for a free glass of organic red or white wine! These special offers are only valid until Friday so make sure to visit the Toku Restaurant website, print out the voucher and bring it in to get these great savings. Don’t forget to check out next week’s offer when we will have some other top dishes available at such great prices, we are practically giving them away! Posted in Food and tagged salmon, Wine. Bookmark the permalink.